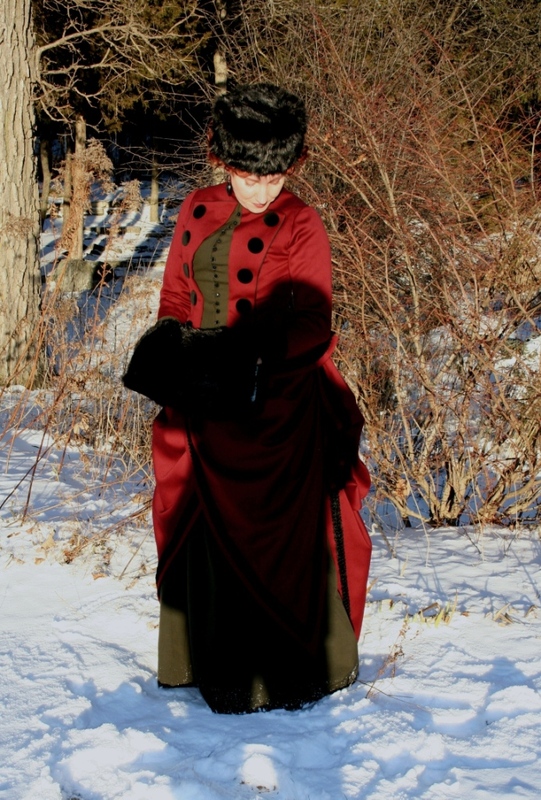 I used a combination of Truly Victorian patterns and ones from Frances Grimble’s book Bustle Fashions 1885-1887. The foundation garments are a chemise I made from a Simplicity pattern, the TV101 Petticoat with wire bustle and my new corset (to be blogged about soon!). 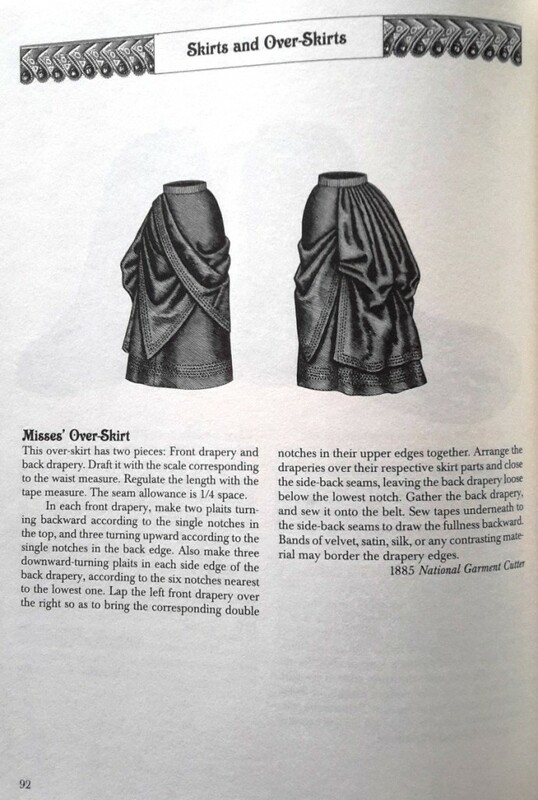 And the front gores of TV 121 1879 Petticoat (now discontinued and replaced with TV125). Since I knew I wanted an overskirt, I wanted the underskirt’s front to be narrow and smooth. I modified it a little making the front points and back panel longer. 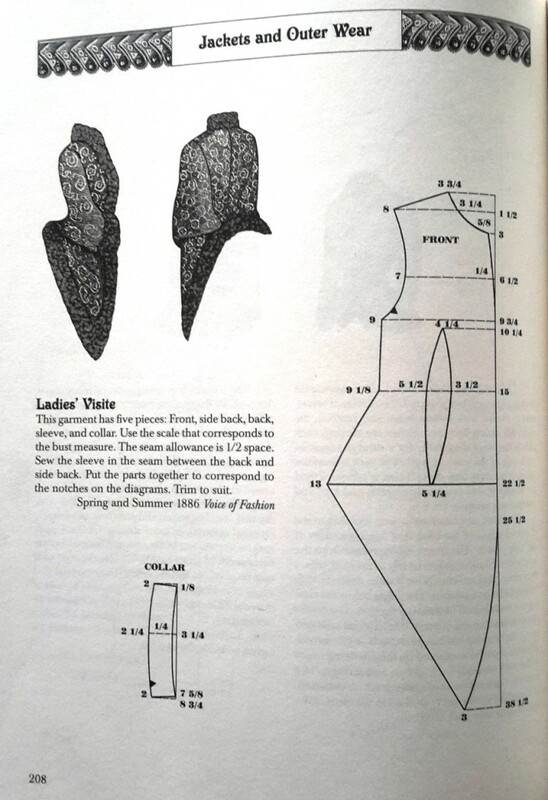 Proportionally, the front points look the same length on me as in the illustration, but when I enlarged the pattern they were quite a bit shorter on me. I lengthened the back panel because a) I had enough fabric to do so; and b) I wanted more to play with for draping – although I think I may revisit the way I’ve bustled/draped the back. Really the only alterations I made to this were for size. The red and green fabrics were both great finds, but one was more stupendous than the other. The green is a lightweight wool suiting I got for $4/m at Fabricland back in the fall – great buy! The red was a score of a lifetime! It’s wool satin. Yes. Not super common, but yes it’s a real thing. If you can find it, it normally retails for at least $50/yd (not the most extravagant cost, but its rarity adds to its preciousness. Precioussssssss). A year or so ago I found nearly 6m of it at the Value Village near my parents’ house. It was $7 for the whole piece. I could. not. believe. my. luck. Despite the fact there was recurrent moth damage throughout the piece, there was enough of it that I knew I could do something with it. And you don’t pass up a find of wool satin like that just because it’s been munched on a little! I had initially intended it for an everyday winter coat for myself. However, when I decided to do this project I knew it was THE perfect fabric to use. Such a luxuriously historically accurate fabric doesn’t come around (to me) that often, it deserved to be something really special. The black trim was another great thrift store find. It was a full spool of probably 30m-40m (I used almost 20m in total on this project and still have lots left) and was something like $2 for the whole shebang. I don’t know exactly what it is, but I’m pretty sure it’s vintage something and it has an astrakhan-like appearance while in no way being real astrakhan. The black buttons are self-cover buttons I made with some scraps of black cotton velvet I’d been hording. Hehe, justification for hording sewing bits! 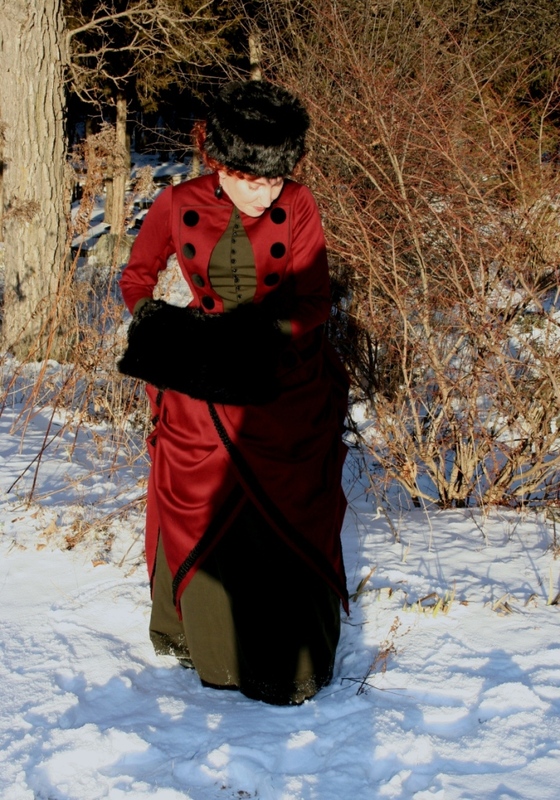 The muff is the same one I made last year for going to the Regency Ball. The fur hat is made from more of the leftovers the muff is made from. So much thrifted and scrap materials went into this, and I love that! Clearly, I need to learn how to style wigs. I hope Kendra comes out with a 19th century/Victorian wig book one of these days! 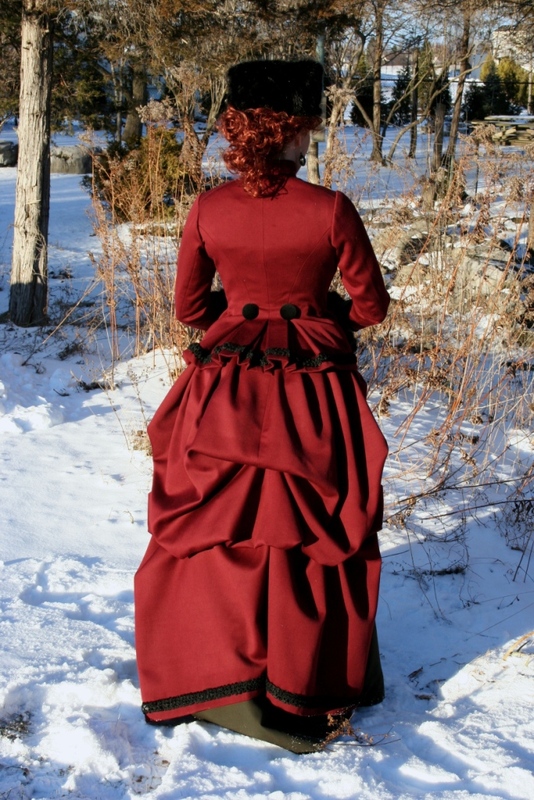 Yeah, that back bustling of the overskirt is a little “blah”. I’ll have to play around with it sometime to make it more interesting. This photo was taken a while into our “shoot” when I realized I’d been partially standing in my husband’s shadow the whole time thus far. Because making the outfit wasn’t enough and I had some red wool satin left-over (and didn’t want awkwardly-sized pieces of this left since I wouldn’t know what to do with it but wouldn’t be able to just get rid of it either) I decided to make a matching dolman! I had initially thought to wear my Autumn dolman with this ensemble as I thought the colours would be close enough, but I just couldn’t resist making an actual matching one – not when I had the perfect fabrics! This one I actually shorted some at the front. As drafted/enlarged it would have been down to my knees and I don’t think that would have looked so good. I didn’t have enough wool satin for the whole thing, so got clever and used this paisley cotton jacquard from stash for the sleeves and collar – and a snazzy little applique on the back. Although it’s perfectly wearable I’m calling it not 100% finished. I want to add one or two more hook & eye sets to close it up a little farther down; and I feel like it needs a little more visual interest on the front. In consultation with my friend, Sarah, I think I’ll continue the black trim around the base of the collar and also add black velvet-covered buttons with cord loops down the front. What do you think? The dolman is lined with more stash materials: wool batting left over from my 18th century quilted petticoat (I’m starting to feel like I want to make another one of those…..that’s probably crazy, but…), machine quilted with some black silk habotai. It’s very cozy! So now I have only a few little scraps of wool satin left – maybe they’ll end up as buttons on something else some day! I think I need to use as many exclamation marks as you’ve shown pictures. 🙂 Where to start? In one week! Wool satin! (And for $7 for 6 meters?!) Red and black! (Just happens to be the same as my new winter coat) Gorgeous! Utterly gorgeous! Thank you! And, yeah, I don’t know if I can ever expect such a great fabric find again. It’s actually a little bit of a relief that I like how well this turned out – what a tragedy if I had wasted such an amazing fabric. 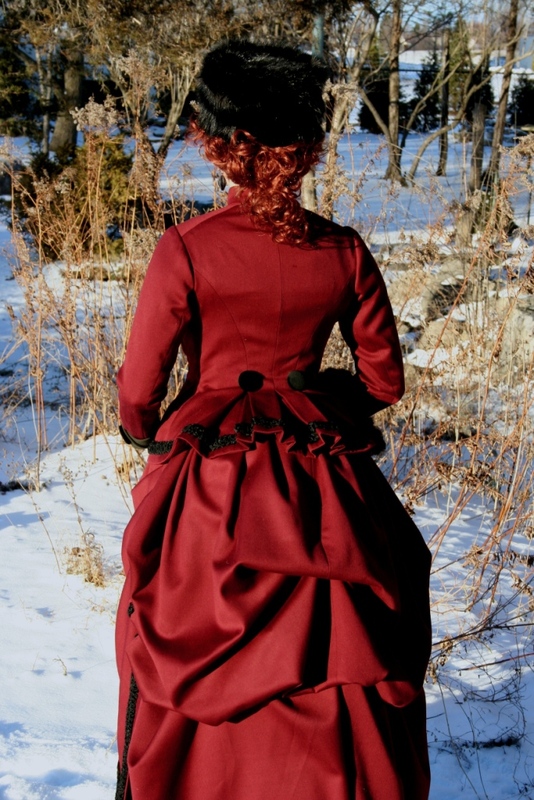 I do still want a red winter coat, and a red & black sounds fabulous! You look truly gorgeous, one week! Amazing. I love the visite (?). It compliments the ensemble perfectly. Wow. This outfit is amazing! You did such a great job on it! Thank you! I won’t lie, I love it! Really really amazing! So glad you shared in a totally look at what I just made way! Love it. Somehow you look very like Kate Winslet a la Titanic here, although of course it’s an entirely different era. =) Lovely outfit! I’ve been dying to make that jacket since I found the pattern, and now you’ve further encouraged me. Oh that’s wonderful! 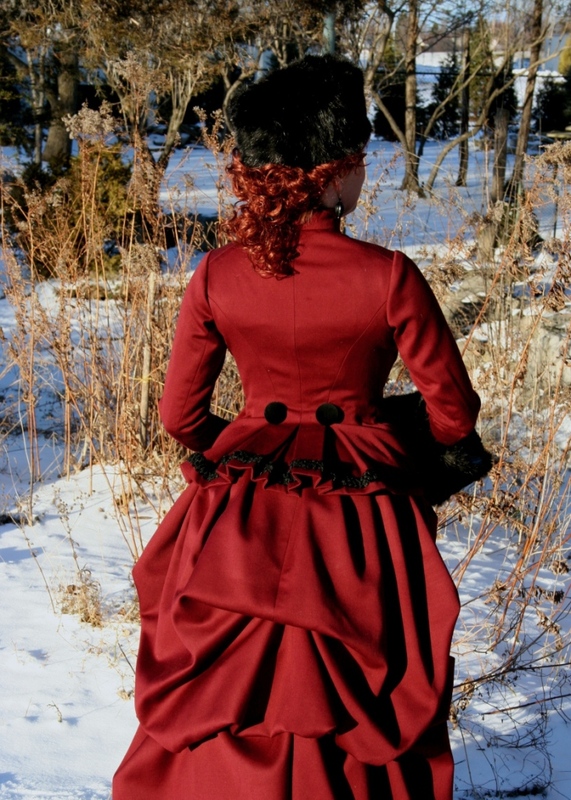 I hope you do make it, it’s such a terribly smart jacket/bodice design! Beautiful! Just perfect! So did you find all those layers and all that fabric warm? I’ve just always wondered. 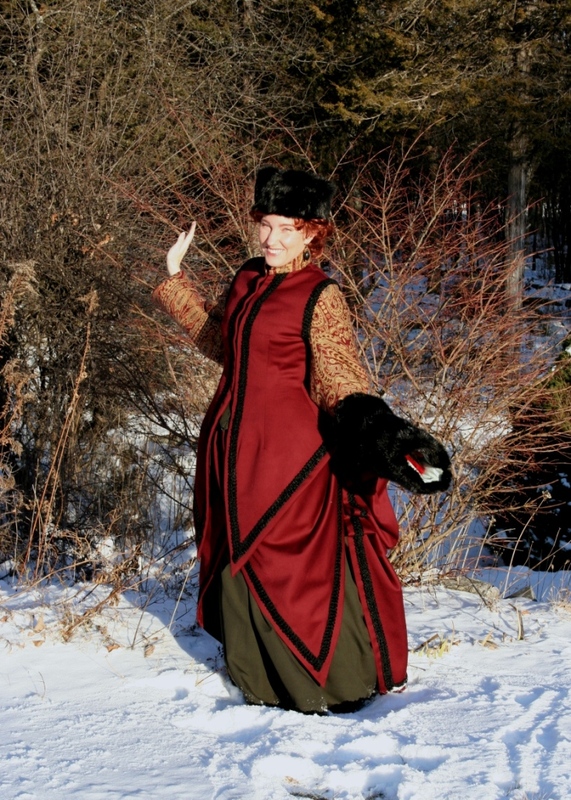 I’ve never seen photos of 1880’s ladies in snow suits! It is all quite warm! The jacket by itself is not really warm enough for winter weather, but the dolman is very cozy. The multiple layers of skirts do their job well. 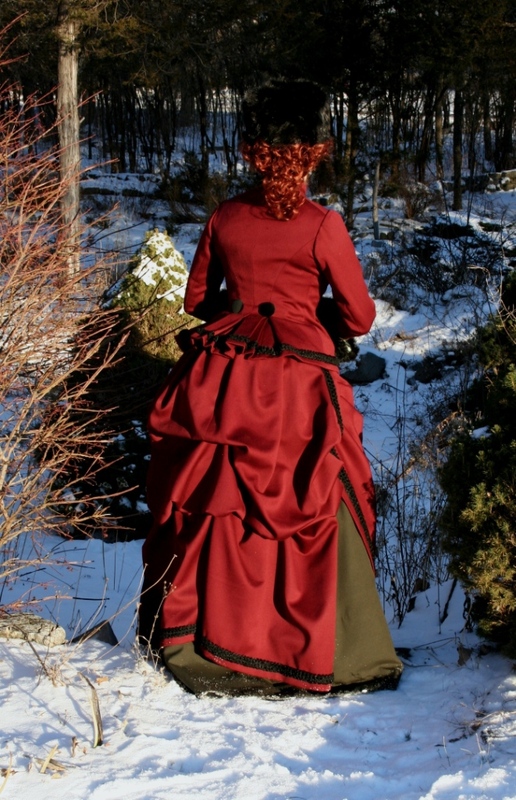 If I was going to spend any real length of time outside in this in winter I might add another petticoat. Interesting! I guess that is just what they did in the 1880’s! Thank you! What fun! That fabric looks lovely! And I am very jealous that your thrift store turns up such amazing things! The ones near me aren’t so good for things like fabric or trim, though they do come in useful for picnic baskets, china, and glassware. Picnic baskets, china and glassware are pretty great to find too! I don’t find great stuff all the time, or even often. I’m not sure I’ll ever manage this particular level of great find again. I’ve just been poking around thrift stores for many years now and always make a beeline for anything sewing related. So, over time I’ve gradually gleaned good stuff. I also tend to acquire fabric based on level of good find it is rather than whether I need it then or not – which has its merits and drawbacks, lol. I love this outfit so much! It’s freaking awesome! (also looks a little lady-bug, if you ask me, that’s why I love it even more!). Can’t decide which version I like more – I think I prefer the jacket bodice look but then I’m such a sucker for dolmans! Lovely! Ha! I would never have gotten ladybug from it, but now that you mention it I can see it. And I like ladybugs so that suits me fine, lol. And I know what you mean about being a sucker for dolmans, they’re just so cool! And this one is going to look even better once I’ve made the little extra additions I’ve planned. Osom, love pattern. Great job!!! Thank you! It was a particularly happy accident that I had all of these to go together. I am trying to use the scales and draft a pattern but when I follow the directions the pattern is coming out huge! As I understand, the scale I am supposed to use is for the full bust measurement. Is that not correct? Should it be for half the bust measurement? I’m trying to draft the ladies basque and as drafted it will be down to my knees and the waist will sit at my hips. Do you have any thoughts as to what I’m doing wrong? Am I supposed to use a different scale for length? Any help or advise you can give will be greatly appreciated. I’m trying to do the overskirt as well. and I am confused by the directions. it says to make the backwards turning plaits along the top according to the notches but, how do I do that without the front showing the underside? Where am I folding the pleats? along the v’s? any help would be appreciated.